Stainless steel watch case, watch band and exquisite crown make the watch more practical and wearable. 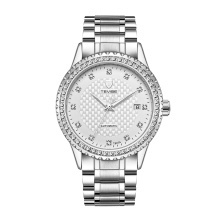 Made from sapphire glass, the dial window has hardness; it is not easy to damage. The waterproof performance reaches 3 ATM so it can handle daily splash, wash hands and rain.